Japanese director Hiroshi Shimizu was a key component of his nation�s transition from the silent era of cinema to the advent of sound. From 1924 to 1957, Shimizu made an incredible 42 movies, possibly more, but his films have rarely seen the light of day on home video, or on any medium in the US. Now, the venerable outfit that is The Criterion Collection makes four of Hiroshi Shimizu�s films the centerpiece of their latest edition of their Eclipse Series. Travels with Hiroshi Shimizu shines a light on the little-known (domestically, at least) director by giving us some of his best works, namely: Japanese Girls at the Harbor, Mr. Thank You, The Masseurs and a Woman, and Ornamental Hairpin. 1933�s Japanese Girls at the Harbor is the only truly silent film in this collection. It�s also the least effective of the bunch, in that Shimizu doesn�t do much to set this film apart from the rest of the silent movie pack. It�s a small drama that tells the story of a schoolgirl named Sunako (Oikawa Michiko), who is in love with a local trouble-maker who calls himself Henry (Ureo Egawa). While he�s at least somewhat interested in Sunako, Henry goes after someone who�s a bit more his speed, Yoko (Ranko Sawa). Sunako won�t stand for this, though, and she attacks Yoko, causing her to leave town and pursue a life as a geisha. Years later, Yoko runs into Henry, only to learn that he�s now married to her school friend, Dora (Yukiko Inoue). This is also the most straight-forward film in this collection, but it�s still a nice overall introduction to what the rest of these Shimizu films have to offer. Next up is Mr. Thank You, a 1936 film that is miles about Japanese Girls at the Harbor both in terms of overall quality and in complexity of style. For starters, Mr. Thank You is not a silent film, and this �talkie� involves an extremely nice bus driver called �Mr. Thank You� (Ken Uehara) who takes townsfolk up and down the mountain in their town. He got his name from his penchant for loudly thanking those who move out of the road to allow his bus to pass, and we see him do just that throughout the course of the single day that Shimizu�s film covers. Unfortunately, many of the passengers on his trips included young girls who never make the return voyage home as they often become prostitutes or workers in horrible factories. There�s a young, 17-year-old girl (Mayumi Tsukiji) on his latest trip, whose mother (Kaoru Futaba) is along for the ride to seemingly say goodbye to her daughter. The joy of this film is in the way Shimizu keeps things moving at the same flowing pace as Mr. Thank You�s bus, crafting a captivating tale that is, at the same time, thought-provoking. 1938�s The Masseurs and a Woman is as consistently still as Mr. Thank You was constantly moving. A pair of blind men, Fukuichi (Shinichi Himori) and Tokuichi (Shin Tokudaiji) working as traveling masseurs, have a steady summer gig at a mountain resort. Tokuichi is the stranger of the two, given his obsession with racing nearly everyone and everything he comes in contact with, as well as his stronger than normal senses. When he smells a woman passing him in a carriage, this lady, Michiko (Mieko Takamine) is amazed that he could catch her scent from so far away. When Michiko begins talking to a man named Shintaro (Shin Saburi) at the same time a slew of robberies occur, Tokuichi�s suspicion about who is responsible for these thefts could be the result of simple jealousy. Despite the static nature of this film�s overall look, there are quite a few layers to this tale that manages to fit a lot in to a scant 66-minute running time. The final film in this set is Ornamental Hairpin from 1941. Shimizu again sets his story at a mountain resort, and this time we see a small group of people there for a calm, quiet summer retreat. Their peaceful vacation is ruined, though, as a larger, noisier group arrives to disrupt everything. Despite the annoyances, love blossoms among a few of the travelers, and Shimizu does another wonderful job taking such an often clich�d subject to another, multi-layered level. Deep, introspective subjects are covered throughout the film�s 70 minutes, and this film serves as the perfect capper on a set of virtually unknown films that any fan of cinema absolutely must see. Image Transfer Review: All four films are presented in their original full frame aspect ratios, and they all look good considering that the newest of them is 68-years-old. The same amount of restoration is never performed on Criterion�s Eclipse Series titles, but it still appears that the dirt, grain, and other print problems have been kept to a minimum here. Audio Transfer Review: The original Japanese mono tracks don�t disappoint, especially given the low expectations we should have for them. They do their job though, in that they offer well-blended mixes with music that never overshadows the crisp, clear dialogue. Extras Review: As always with Criterion�s Eclipse Series, there aren�t any extras on these discs. If you consider yourself a movie buff, yet have never seen a film by Hiroshi Shimizu, take comfort in knowing that you�re not alone. The Criterion Collection aims to change that with their four-DVD box set of some of his most important films. 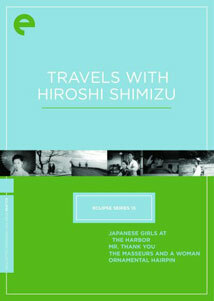 Travels with Hiroshi Shimizu is, like the rest of their Eclipse Series, is devoid of extra features, but the audio and video presentations are quite good, albeit not up to the company�s lofty standards.